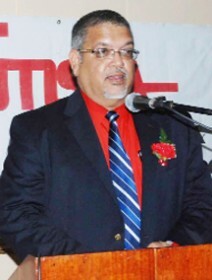 [www.inewsguyana.com] – Former Chairman of the Private Sector Commission (PSC) Ramesh Dookhoo has called on the Guyana Government to resists calls for it to take over the Berbice River Bridge – a public/private partnership project. “The Private Sector will not support any takeover attempts by the government of any private entity,” Dookhoo declared at the opening of Guyexpo2013 on Thursday, October 3. The Former PSC Chairman said the private sector was stifled in the past by socialistic national polices. He also recalled how most of the private sector commercial entities were nationalized causing private capital to decrease in a way that led to the eventual collapse of Guyana’s economy. He believes that the private sector is the future of Guyana and recommends that the country continue to work towards diversifying the economy and its reliance on traditional exports. “There is no doubt that confidence in our economy abounds and the investment can attest to this” Dookhoo stated. The bridge which is tolled was opened on December 23, 2008.